I remember during school in the mid-1970s, we often enjoyed an educational film that felt like a break from the normal school curriculum. The films consisted of a projector, screen, and a large reel of film that made a loud clicking noise in the background throughout the presentation. Towards the late 1970s, I remember we began watching education films on TV using the latest technology; Betamax. In the early 1980s, consumers were able to purchase a device that played popular movies at home. The problem consumers faced at that time was deciding which format to purchase; VHS or Betamax. At a price of $1,000.00 USD and up, the purchase of such a device was an enormous investment for most families. The ongoing debate during that time was about which technology would become mainstream, and which would become obsolete. Initially, Betamax owned 100% of the market in 1975; however, when VHS was released, a battle for the consumer was born; so by 1981, Betamax dropped to just 25% market share in the United States, and by 1986, 7.5% market share in the United Kingdom. Ultimately, those who invested in VHS had a wider variety of movie selections available, while those who invested in Betamax stood by and watched their movie options diminish each time they went to the video rental store. Building ITSM solutions require significant time and a significant amount of money. Projects need to be aligned with current needs as well as future technologies. For example, if an organization invests in an operating system that is not widely adopted in the marketplace, they might see their options decline when looking for software providers, integration, and expertise; similar to those who chose Betamax that ultimately had fewer options in movies. 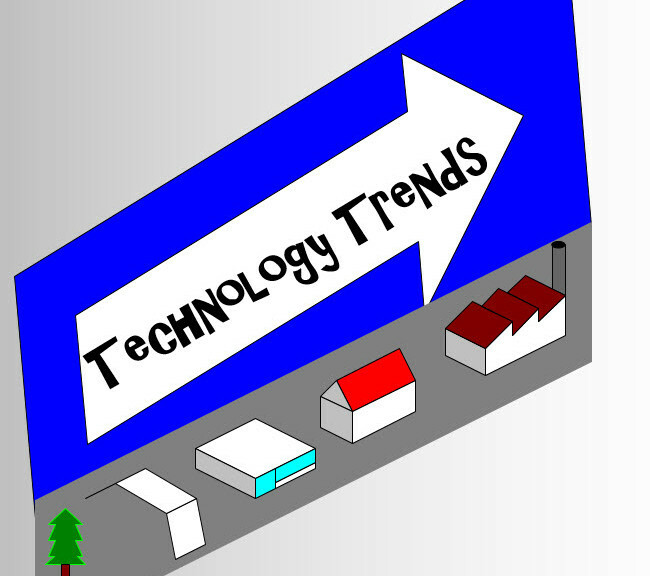 Not only is it important to understand the needs of your organization, it is also important to understand the current technology trends. For those who are making decisions regarding ITSM solutions within an organization, it is important to understand IT trends. The reason; to stay competitive and efficient. Trend can be defined as a ‘shift’ or ‘bend’ which in summary means to change direction or move in another direction. In Gartner’s Top Ten Technology Trends report, they also claim, the rapid evolution of social media and mobile technologies is driving consumer behavior, especially with Gen Z, which grew up expecting on-demand, speedy, but flexible services. I plan to discuss this trend in more detail on the last installment of this series. I think it is safe to assume that mobility is no longer a trend, rather a way of life. The trend we are seeing now in the world of mobility is wearable devices. All ITSM projects need to include mobility capabilities for both analysts and their customers. Although it might be premature to create specific wearable ITSM projects, supporting today’s mobility platforms should put your solution in a better position to support the onslaught of wearables entering the marketplace. Mobility should be a subset of all your ITSM projects. It is important to offer the same services from mobile devices as from a PC. All IT organizations should have mobility as part of their requirements when looking for an ITSM solution provider. Cloud technology has matured; however, it still may not be ready for some organizations. Companies offering cloud solutions often tout their uptime (typically 99.99%) along with cost savings and simplified management requirements. However, be cautious when choosing this type of infrastructure. Sometimes ROI is not achieved for several years, so be prepared to make a long term commitment to your solution provider if you wish to see that cost savings. Also, consider that your data is with a third-party. Make sure you understand the termination provisions if your organization and provider part ways. Security can also be an issue, especially if your organization has to meet government requirements to protect personal data. Who will be responsible if there is a security breach and consumer personal data is stolen? Who will pay for the lawsuits and government fines? I believe cloud technology has significantly improved over the past couple of years; however, it may not be the right solution for all organizations. I will discuss this in more detail in part 4 and 5. Many experts believe that IoT devices could reach up to 50 billion by 2020. There is no doubt there will be a market disruption as IoT begins to flood the markets. With IoT, access to systems and applications is provided using Identity and Access Management (IAM). However, traditional IAM solutions are not capable of dealing with the relationship and access requirements that come with IoT. Therefore, the Identity of Things (IDoT) is an extension of IAM that applies a unique identifier (UID) to IoT devices/objects, which allows you to control relationships and access between IoT and other entities inside and outside of your organization. In the near future, I expect ITSM solutions will be required to support IoT along with IDoT. Presently, IoT APIs are too segmented to begin building a specific ITSM project around IoT. Funding such a project would be risky and could waste money. However, service managers can prepare for the oncoming IoT technology surge with the right projects in place. I will discuss this in more detail in part 3 of this series. 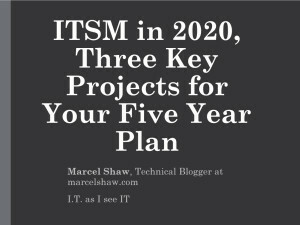 On November 18 I plan to introduce three key projects that will help you meet ITSM demands over the next five years while building an infrastructure to support ITSM demands that are expected in the future.